Firepower: this is where I'm leaning. 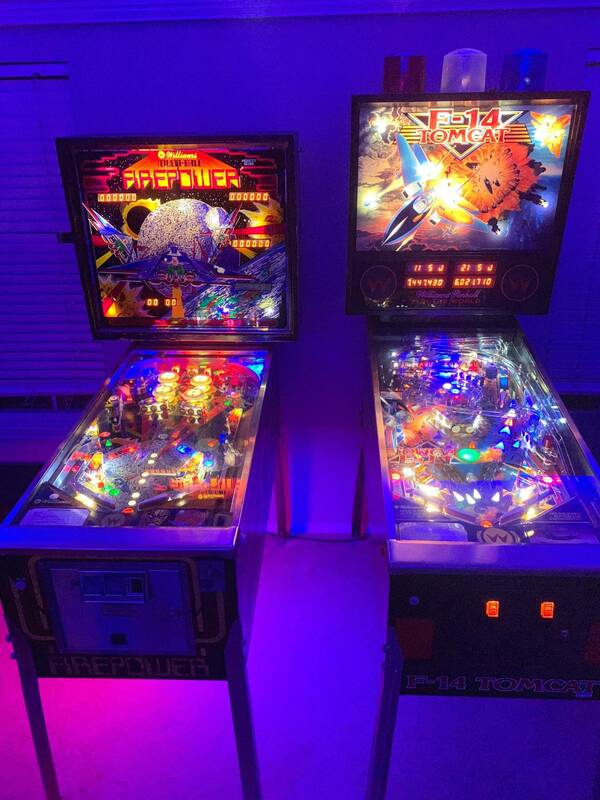 It's like owning a little piece of pinball history, and I like the game from playing it a little bit on location. I'm wondering if it's too simple though- I like simple games, but this one might get old quick. Also, would a 1980 game likely be a lot more repair-intensive than one from later in the 80s? F-14 Tomcat: seems like a good alternative if I don't go with a Firepower, but probably twice as expensive. High Speed: this is one of my all-time favorites, but I'm leaning against it since I've played it so much on location (and still play it). That said, I'm tempted and it seems like there's potential to make it a completely different game by changing the settings. Any experiences with buying a game that you've already played the crap out of enough to know inside and out? All three are plentiful and relatively cheap - I don't think the spread between a nice FP and a nice High speed or F14 is really that big. All three were played to death in arcades and may show varying degrees of wear. They are all great games. I would probably lean toward high speed of the three, but you really can't go wrong. ANd yes, Firepower will require more work/care to "bulletproof" as the System 11 games are much better designed. Firepower can also play pretty janky if not given a lot of attention. As a baseline, you want to be able to hit that top lock shot with the right flipper. I like F-14 more as its a real battle you verse the machine, especially with the yagov kick back but both are probably about the same amount of fun. I like F14 but I find it less interesting and it gets old faster. No combo shots, not a lot of flow for a Ritchie game (it does have nice spinner shots), and no ramps either. Not a lot of innovation either (well the kicker is cool! )...FP invented a ton of cool stuff, and High Speed invented the Picard Maneuver! My least favorite of the three for sure, but no arguing that it's quite a spectacle when you get the sirens going. Amazing music too especially the "multiball ready" tune. i dont like the progressive jackpot carry over on high speed where if player 1 cashes in ball 1 you just have to grind for a day to try and come back. im pretty sure you cannot change that in the settings but ive heard of a custom rom that fixes this. youve probably have seen it more than me, is that correct or am i completely wrong? There is a tournament ROM that fixes the Jackpot at 750,000 I believe. Not sure where you get it but it certainly fixes the issue. Of the 3 I've only played HS once and owned an F14. For what it's worth, if an F14 came up relatively cheap I'd be all over it. It's just so immersing to me. When I'm done I feel as though I've had a workout! I owned a High Speed and couldn’t get rid of it fast enough. Left orbit to ramp alllllllll day - I got sick of it real quick, and super sick of it on days when I couldn’t hit the ramp consistently. At least around me I would agree with crazylevi. You could probably get into a players version of any of those games within 200 bucks of each other. I prefer F14 to Firepower personally. This might get some flack, but I actually prefer Flash to Firepower for “budget” early SS Ritchie titles. Aside from looks and sounds where Firepower is probably objectively better, I don’t care much for the game, like Levi said, the shots just don’t feel great to me and the spot targets are a death trap shot that kills the fun for me. Flash has 8 drops, a killer spinner rip, the side saucer, and a bonus multiplier that takes some classic Bally style nudging to get to...might be worth a look for you, and they usually come cheap. Of what you listed, F14 gets the nod from me! I'm honestly not the biggest fan of High Speed. It's really just a left ramp shot all day kind of game. Brilliant back when it was made, but it's among the games that hasn't aged well, imho. Still, it has great flow, satisfying spinner ripping, and that picard maneuver still feels fantastic. F-14 has a great package, and has a unique layout, but it's kinda clunky, and feels claustrophobic. I imagine it was done on purpose to give the game speed, but the super close-to-the-flippers-standup targets really mean you're flailing a lot, hoping you'll somehow complete the sequence. The light show is crazy, and it really is an adrenaline game for sure. To me, it feels like this was the spiritual successor to Firepower. Firepower is shallow, but has a surprisingly difficult to achieve multiball, and when you DO get multiball, it lasts all of 5 seconds. Getting multiball again in the same game is harder since the rules make it more difficult (smart!). No jackpot though means the only incentive is to see the displays count down and the light show (fun for 1980, not as fun for 2018). There's a surprising amount of shot accuracy that's needed in the game though to make 1-6 and to lock the balls. There is a ROM hack floating around that uses a System 7 board conversion to broaden the rules in the game. I think it they were all equally priced and all equal condition, I'd take F-14 first, followed by Firepower, with High Speed bringing up the rear. At the end of the day though, you really can't go wrong with any of them. My only two pins.. I love them both, but I play Firepower more often. Simple, inexpensive, and just pure fun. Thanks for all the suggestions. I just saw a really nice FP for sale and jumped on it, picking it up next weekend! Good choice. F14 is one of the few games I've owned that I have almost no interest in owning again. It's not bad. In fact it has a lot of good things, but somehow it's just not equal to the sum of it's parts.